Nike followed up the Write the Future television commercial campaign with “Write the Headline”, an interactive display run in Johannesburg throughout the FIFA World Cup. 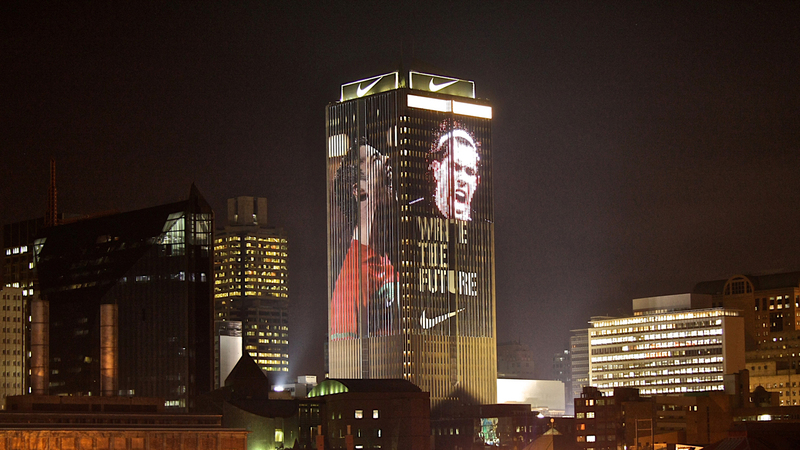 The massive display, almost half the size of a football pitch, was projected onto the Life Centre, a prominent building on the Johannesburg skyline. Fans from across the globe were challenged to predict the headlines for the following day’s news. Messages were submitted via Facebook.com/nikefootball, Twitter, Mxit (South Africa) and QQ (China) to over fifty of the top Nike World Cup athletes from around the world. The display supported messages up to 57 characters in 12 languages and displayed up to 100 messages per night. Deeplocal, Pittsburgh, used their own web software system, Handlr, to manage inputted messages, moderate them, and output them to the LEDs. Handlr is a web-based submission tool that makes pulling content from multiple locations simple. Handlr can accept inputs from Twitter, Facebook, RSS, Web, etc. The system features a web moderation panel for message review and a system for posting or outputting approved content to third party locations. A separate system was provided for photographically documenting all the submissions (a photographer shooting in the early hours of the morning) which were then posted on an online gallery and sent back to the fans that had submitted the text. The Write the Headline campaign was developed at W+K, Amsterdam, by co-creative director Mark Bernath and Eric Quennoy, copywriter Arvid Lithander, art director Tejmur Sattarov, project manager Sharon Kwiatkowski, producers Ross Plummer and Erik Verheijen, executive creative director Jeff Kling, strategic planner Dan Hill. Nike’s team were brand director Mzamo Masito, brand connections manager Ed Collin, global digital content manager Danny Tawiah and global football digital brand director Jesse Stollak. Rumpus Room, London, Deeplocal, Pittsburgh. Media ownership was by Impact Media. Media systems were engineered at Spectrum Digital Networks Solutions. 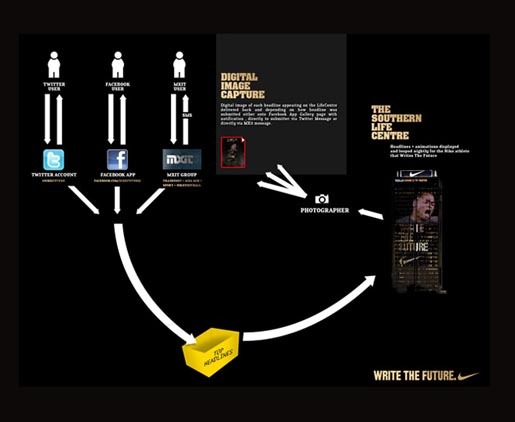 Digital Mixit development was by Trigger, Johannesburg. Media was brokered by Mindshare. Still and video capture was by Big Mouth.